Durable resin is crafted into these Sea Green Frames. 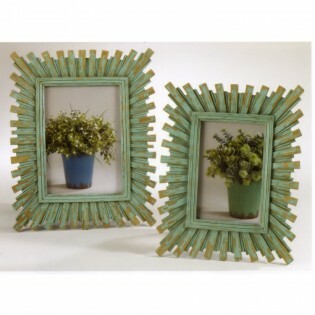 With the look of weathered wood in a sunburst design these photo frames will add a touch of color to your home while holding your favorite photo. Durable resin is crafted into these Sea Green Frames. With the look of weathered wood in a sunburst design these photo frames will add a touch of color to your home while holding your favorite photo. Easel back, table top display only, horizontal or vertical.